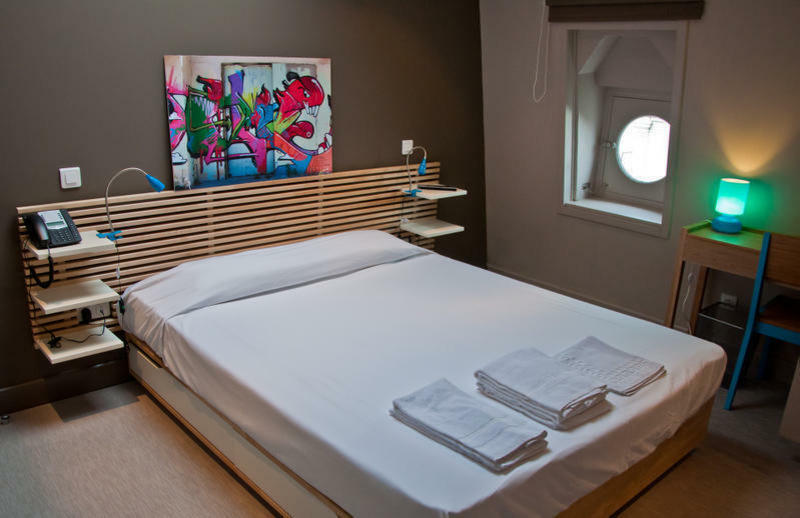 Pop' Hostel is the perfect option for your stay in Avignon. Centrally located, our wine bar offers a friendly atmosphere serving quality local wines and excellent regional tapas in a design conscious setting and our boutique gives you the opportunity to sample the regions products. Our lounge area provides a relaxing space where library and computers are put at your disposal. We stage regular art and musical events and are partners with some of the hottest spots in town. -air-conditioned rooms for single or double occupancy, providing single or 'king size' beds, private shower and toilet facilities, television, telephone and free Wi-Fi. -air-conditioned rooms for group or family occupancy of 3 or 5 people, providing single and bunk beds with private storage area, private shower and toilet facilities, television, telephone and free Wi-Fi. Excellent location for this Hostel in the centre situated in a beautiful 18th century building, right on the rue de la RÃ©publique in the heart of Avignon, at 500 m of the central station, 400 m of good parking facilities (Parking Jean JaurÃ¨s) and within 10 minutes walk of the historical sites of Avignon. From the central station: Walk out of station, through the city gates and onto rue de la RÃ©publique - you're there! From the TGV station: Take a bus to Avignon central station - follow instructions above! From Avignon airport: Take a bus to Pont St BÃ©nezet, go through the city gates and walk toward the Palais des Papes, Place d'Horloge and then descend into the rue the la RÃ©publique - you're there! By car: Follow the signs to Avignon city centre. At the city walls follow the signs to Parking Jean JaurÃ¨s (entrance rue St Michel, south Avignon). Park the car! Once out of the parking turn right onto rue de la RÃ©publique - you're there!